The White House on Tuesday took a step forward in coordinating Federal response to cyber incidents in the United States with the announcement of a Presidential Policy Directive on United States Cyber Incident Coordination (PPD-41). Threat response activities–Led by the Department of Justice (DOJ) through the FBI, these activities include investigating the incident, gathering intelligence, linking related incidents, identifying other affected entities and ways to pursue the threat, and facilitating information sharing with asset response. Asset response activities–The Department of Homeland Security (DHS), through the National Cybersecurity and Communications Integration Center, will act to provide technical assistance to those affected, identify others at risk, assess risks to that region or sector, and find ways to mitigate those risks. 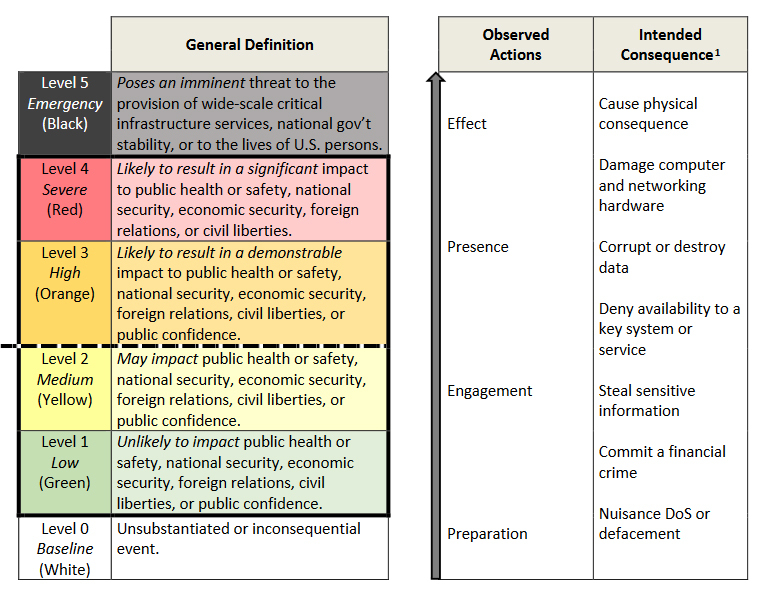 Some of these responsibilities will overlap with threat response, according to the directive. Intelligence support activities–The Office of the Director of National Intelligence, through the Cyber Threat Intelligence Integration Center, will lead this area by building threat awareness and information sharing, analyzing trends, identifying knowledge gaps, and analyzing ability to degrade threat capabilities. In conjunction with this directive, the White House also released a cyber incident severity schema, which establishes a common framework through which Federal agencies can evaluate cyber incidents. The establishment of the FBI as the lead in Federal response to threats is significant, as a hearing on small business cybersecurity earlier this month revealed that many businesses do not know who to go to as the first response to cyber incidents. To this end, the directive requires that DOJ and DHS maintain a record of government contact information for the public to use in the event of a cyber incident. Communication is a core aspect of the new directive, as it emphasized the need to coordinate with state, local, tribal, and territorial governments as well as international partners. The directive also codifies the establishment of a Cyber Unified Coordination Group (UCG), which will act to coordinate Federal agencies and, when necessary, private-sector partners in the event of a cyber incident. This directive builds on the goals set forth in the Cybersecurity National Action Plan (CNAP), released by the White House in February.